Decorations can add a festive mood to a Thanksgiving day meal. In this article, we have gathered a collection of easy Thanksgiving DIY decorations that won’t break the bank. The key is to use what you have and low-cost add-ins. Tour your backyard for items you can use such as twigs from bushes and trees (those with berries are great), leaves, pinecones, acorns, berries, seed and grass heads. Check out your grocery store for mini and medium size pumpkins and gores; apples; Indian corn; and cranberries. Finally, look for artificial leaves, cranberries, mini pumpkins, Indian corn, raffia, jute, candles, and ribbon at a discount or hobby stores. Once you have everything together, let’s check out ideas for easy Thanksgiving DIY decorations on Pinterest. Clicking on the images will open the Pinterest page. Easy and Fast Thanksgiving Fall Decor. Glass vases, mason jars, bowls, and cake stands make excellent containers for easy Thanksgiving DIY decorations. 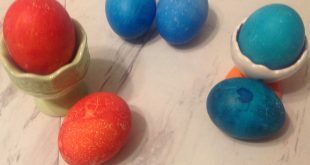 Moreover, these containers can be used again for other holidays. Fill tall vases with twigs and artificial leaf sprigs for a simple, yet beautiful display. However, bittersweet twigs with berries are attractive as is. Fill smaller containers with acorns, cranberries or mini pumpkins or gores. Choose a pedestal cake stand over a flat cake stand. If you don’t have one, use silicone to attach a candlestick to a flat plate. Start by layering real or artificial leaves over the plate then add pumpkins, nuts, pine cones, seed pods, etc. Start at the center of the plate and work out. Your first layer will stay as put, but if you start layering on top of your first row, you will need to hot glue to the lower layers. The picture shows a big pumpkin; however, you can use whatever you have to make yours. DIY Thanksgiving Decor Ideas. 80+ DIY Thanksgiving Decorating Ideas. Via Craft River. A few broken twigs make a simple statement in a vase of water with a floating candle. The mixed fruit floating candle comes from Taste.com and has a video showing you how to do it. Lastly is a mason jar wrapped with leaves using mod page. Of course, this takes a little time to do, but it is an easy Thanksgiving DIY with beautiful results. There is a variety of objects to use as containers for your Thanksgiving table decorations. For example, you can use wooden crates, baskets, galvanized tubs and buckets, small drawers and boards–including old barn wood or an extra leaf from your table. Start your design in the middle with the biggest and tallest objects working out to nuts, leaves, and other small objects at the edges. If you are using this on your dinning table, you can add edible fruit such as grapes. Lastly, the three upside down wine glasses on top of a mirror is an easy do it yourself decoration. Thankful tree...Love this. Each day in November, each family member jots down something they're thankful for & hangs it on the tree. By Thanksgiving Day, the tree is full. You can save them for next year, or create new ones every year as new blessings occur! This DIY basket wreath for Thanksgiving is a new take on the fall wreath! Try it out! Aren't we all thankful? You can make door decorations that are not wreaths. The first example is pinecones suspended on strings making a cascade. The second door decoration utilizes a basket with “thanks” stenciled onto it. 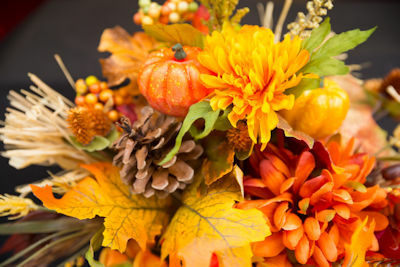 Then artificial flowers or any fall themed item can be glued to the bottom of it. Finally, there is the thankful tree. To create, hold a group of twigs upright using peddles. Your family or quests write what they are grateful for and attach to the tree. More gratitude tree ideas can be seen at Thanksgiving Gtatitude: Ideas and Activities.